Scavengers is an offshoot of Noisy Toys, taking the essential ingredients of Making & Tinkering with a focus on sustainability and technological empowerment. Scavengers workshops involve upcycling electronic waste and hacking some retro games. We take apart old computers and we find useful things, and then we learn how to easily and safely turn them into mechanical, acoustic and electromagnetic instruments that we use to make weird music and build our own arcade games consoles. This can be a fun and accessible route into coding and more advanced electronics skills. Watch the video from Scavengers at the Festival of Thrift 23-24 September here. •	Nose Test; use your body as part of a circuit to conduct electricity. •	Bass Buzz; feel 1000 watts of bass vibrations with your fingers. •	Goop Test; make some cornflour dance like an alien blob with bass power. Scavengers workshops can be structured for a classroom setting, or drop-in, where people can come and go. They are the culmination of ten years of Noisy Toys workshops in schools and at music and science festivals. 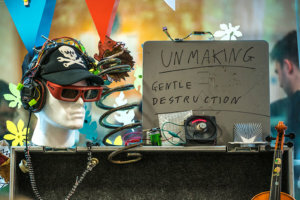 Deconstructing discarded computers and other e-waste, and salvaging resourses to make new instruments. Un-Making is often combined with the Noisy Robots workshop so that participants get the full experience of sourcing their own materials, or it can be run on it’s own with more of an in-depth look at the sustainability issues.Un-Making is also fantastic as a drop-in activity for open plan events. Using the art of ‘Un-Making’ the students have loads of fun deconstructing old computers with screwdrivers, salvaging the treasures that lurk inside and building new instruments with them. We will learn about the true cost of consumer electronics, and the wider long-term consequences. 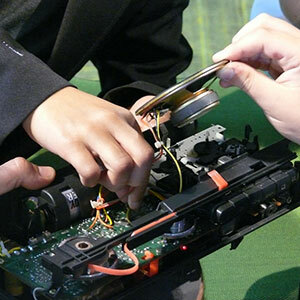 Many technical and creative skills also come into the activity, with lots of use of tools and instrument design. You can be a scavenger too with a screwdriver and an old computer- what treasures are inside and what do they sound like? Young Scavengers with their unmaking treasure at Manchester’s Band on the Wall, with Brighter Sound and Noisy Toys.